I know that there is great sadness in the animation and film-making community that an icon in the industry has passed. He was certainly an icon in my eyes. When I was first so privileged to join the team on the 1980s Gumby TV series it was obvious that I was embarking on an adventure that would thrust me on my way to a career. Something in his eyes when he interviewed me told me that I was in the presence of a deeply caring and generous human being. And then I was floored when he asked me to stay on the smaller crew for his Gumby Movie. I owe my career completely to him and I’m sure that many others feel the same way. Thank you Art, you’ll be deeply missed. I found a couple of photos from the set of Gumby that I thought I’d share here. The first is a grouping of puppets set up for a Christmas card photo shoot. 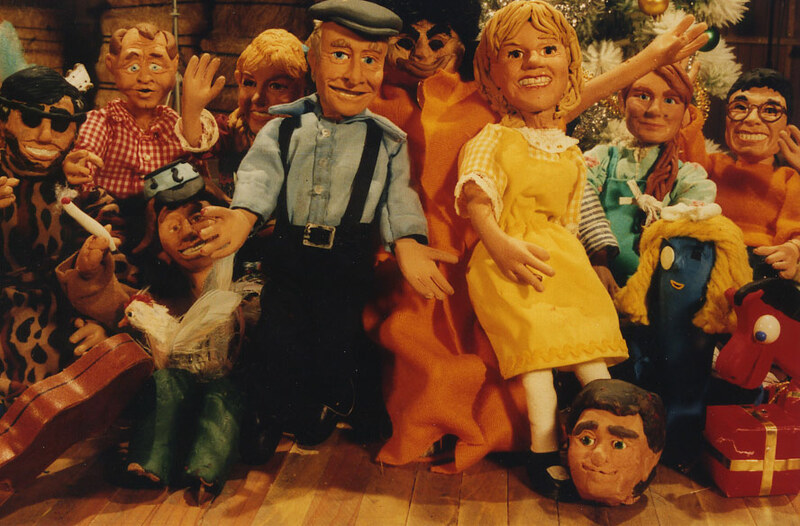 The Art Clokey puppet as well as his late wife Gloria (both in front), Holly Harman (over Art’s left shoulder), Cora Craig – who made the costumes and Denis Yasukawa – model maker (to Gloria’s right) were all sculpted by yours truly. It was such an honor to do sculptures of Art and his family. The second photo was taken on the set of the Gumby Movie. 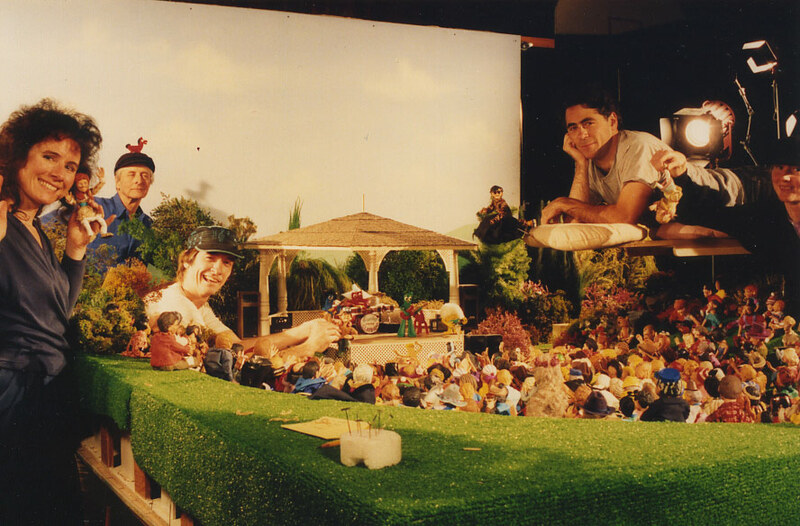 Lynn Stevenson (editor) on the left holding her puppet likeness that I also sculpted, the late animator Ken Willard next to the gazebo, animator Dan Mason on the platform rig and production artist Tansy Brooks next to him on the far right. And way in the background, looking proud as can be with his pal Pokey riding on his hat is Art Clokey. What a great experience it all was, one of the best in my lifetime.